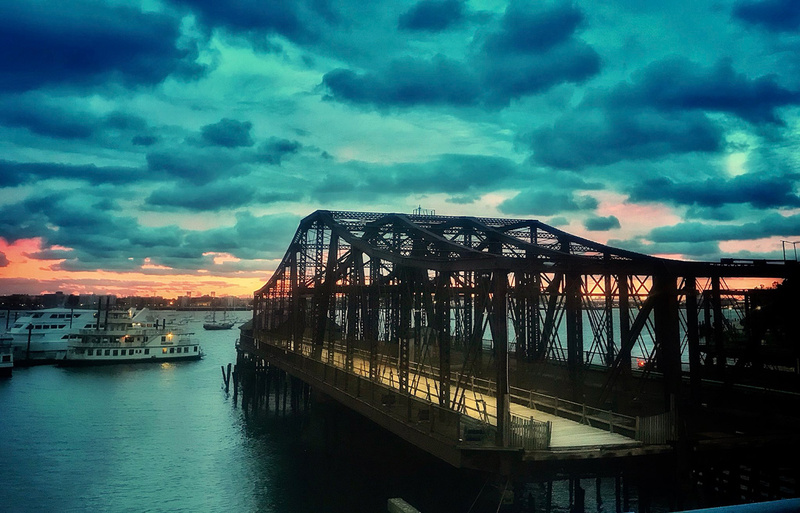 Rick Macomber watched the burst of light this morning over the Northern Avenue Bridge, Fort Point Channel and the harbor beyond. This picture is beautiful. Thank you Rick! This bridge should be fully restored and preserved as it is and remain a pedestrian and bicycle bridge with no car traffic! We need to preserve our history in Boston. It would be also easier to walk to the Seaport District this bridge as the Moakley is not very pedestrian friendly due to the fact that it goes up and then goes down. Perhaps when they renovate this bridge the city could figure out a way to have this bridge raised during storms and abnormally high tides and then lowered during normal times? It hasn't fallen into the harbor yet? Didn't the city cite a report saying that the bridge was in such bad shape it could literally fall into the harbor during a big storm when they decided to rebuild it with vehicular traffic? Or maybe that was a bit of hyperbole to get people who want to see this restored or any new bridge to be non-vehicular off their back. Prior to that truncation of the "Official Navigable Length" of the Fort Point Channel, the Corps had plans to dredge the Fort Point Channel as part of the Boston Harbor Dredging Project originally approved circa 1986. Now 30 years later that project is underway -- although the dredging will now stop just before the Northern Ave Bridge structure. It would make more sense for the Fort Point Channel to just be delisted from the Navigable Waterways of the US thereby allowing Massport and Boston to decide how to proceed with the Northern Avenue Bridge area. The Bridge could then to be sold to a developer with the stipulation that the Commonwealth be granted an easement for passage across the Channel in the approximate ROW or at least within the footprint of the Bridge [including when in the open position]. Or possibly something even more creatively solved!